“…..our view right now: 1% [growth] and not a recession However, the best argument against a recession is unfortunately also an indictment for how weak the recovery is. 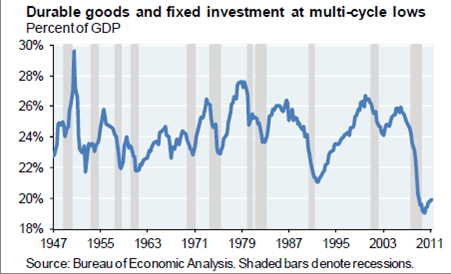 The chart below shows the combined level of durable goods spending (by consumers) and fixed investment (by businesses, in property and equipment). 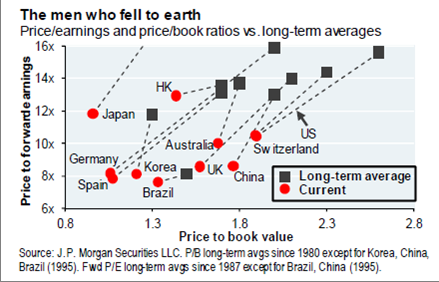 Equity markets are priced cheaply relative to expectations of future earnings, but without more evidence that QE is having more of a positive impact on the US economy, we believe QE-driven equity market gains will be temporary. We typically take a dim view of any investment vehicle that’s associated with the word “leveraged”, and would be very careful with banking stocks right now, preferred or common, unless you can get a sweet heart deal like Warren Buffett’s. As to the Asian market, although equities may appear attractive right now as the Shanghai Composite has under-performed the S&P500 for the past two years, bear in mind that Asian economy is still mostly manufacturing-based and heavily dependent upon exporting to the Western developed countries. Since based on most forecast, the U.S. and Europe will be experiencing a pronounced slowdown if not a flat-out double dip recession, China and Asia are bound to be negatively impacted. Furthermore, Asia, and China in particular, have their own problems of accounting/loan transparency, over and under capacity depending on which sectors you are talking about, and socioeconomic imbalance all could mean headwinds ahead. Regarding the U.S., as noted before, we see anemic growth is a more likely scenario than a double dip recession. However, as far as equity markets are concerned, until there are some policy / tax change ((No, QE3 or Operation Twist 2.0 does not count), to really impact the fundamentals of the U.S. economy in terms of, for instance, new jobs creation and business investment, it would be a trader’s market, stuck in between profit taking and bargain hunting.